The excerpt below is from a recent comment thread, arguing that the US Navy should de-emphasize carrier groups in favor of subs and smaller surface ships. Technological trends such as rapid advancement in machine learning (ML) and sensors will render carriers increasingly vulnerable to missile attack in the coming decades. 1. US carriers are very vulnerable to *conventional* Russian and PRC missile (cruise, ASBM) weapons. 2. Within ~10y (i.e., well within projected service life of US carriers) I expect missile systems of the type currently only possessed by Russia and PRC to be available to lesser powers. I expect that a road-mobile ASBM weapon with good sensor/ML capability, range ~1500km, will be available for ~$10M. Given a rough (~10km accuracy) fix on a carrier, this missile will be able to arrive in that area and then use ML/sensors for final targeting. There is no easy defense against such weapons. Cruise missiles which pose a similar threat will also be exported. This will force the US to be much more conservative in the use of its carriers, not just against Russia and PRC, but against smaller countries as well. Given 1. and 2. my recommendation is to decrease the number of US carriers and divert the funds into smaller missile ships, subs, drones, etc. Technological trends simply do not favor carriers as a weapon platform. Basic missile technology is old, well-understood, and already inexpensive (compared, e.g., to the cost of fighter jets). ML/sensor capability is evolving rapidly and will be enormously better in 10y. Imagine a Mach 10 robot kamikaze with no problem locating a carrier from 10km distance (on a clear day there are no countermeasures against visual targeting using the equivalent of a cheap iPhone camera — i.e., robot pilot looks down at the ocean to find carrier), and capable of maneuver. Despite BS claims over the years (and over $100B spent by the US), anti-missile technology is not effective, particularly against fast-moving ballistic missiles. One only has to localize the carrier to within few x 10km for initial launch, letting the smart final targeting do the rest. The initial targeting location can be obtained through many methods, including aircraft/drone probes, targeting overflight by another kind of missile, LEO micro-satellites, or even (surreptitious) cooperation from Russia/PRC (or a commercial vendor!) via their satellite network. 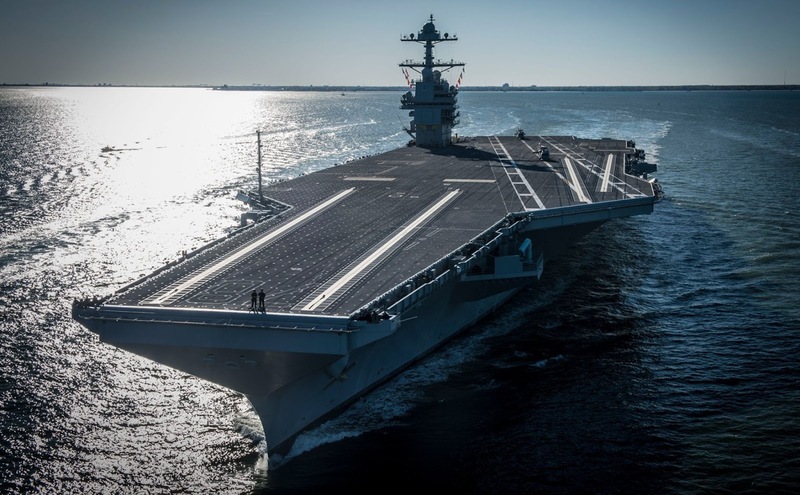 … the Navy plans to modernize its carrier program by launching a new wave of even larger and more expensive ships, starting with the USS Gerald Ford, which cost $15 billion to build — by far the most expensive vessel in naval history. This is a mistake: Because of changes in warfare and technology, in any future military entanglement with a foe like China, current carriers and their air wings will be almost useless and the next generation may fare even worse. … most weapons platforms are effective for only a limited time, an interval that gets shorter as history progresses. But until the past few years, the carrier had defied the odds, continuing to demonstrate America’s military might around the world without any challenge from our enemies. That period of grace may have ended as China and Russia are introducing new weapons — called “carrier killer” missiles — that cost $10 million to $20 million each and can target the U.S.’s multibillion-dollar carriers up to 900 miles from shore. … The average cost of each of the 10 Nimitz class carriers was around $5 billion. When the cost of new electrical systems is factored in, the USS Ford cost three times as much and took five years to build. With the deficit projected to rise considerably over the next decade, defense spending is unlikely to receive a significant bump. Funding these carriers will crowd out spending on other military priorities, like the replacement of the Ohio class ballistic missile submarine, perhaps the most survivable and important leg of our strategic deterrent triad. There simply isn’t room to fund an aircraft carrier that costs the equivalent of the entire Navy shipbuilding budget. See also Defense Science Board report on Autonomous Systems.